You'll log in using the Traveler's email address and the password you created during registration. *Be sure to access the profile on Google Chrome or Firefox to ensure you can view all of the information correctly. 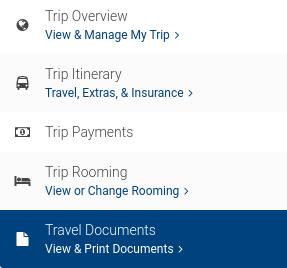 Here you can check the progress bar to see if you are 100% ready for the trip or if we still need more information from you. If you are not at 100% yet, you will see the notifications for the missing information, and you can click on the link to update each section. 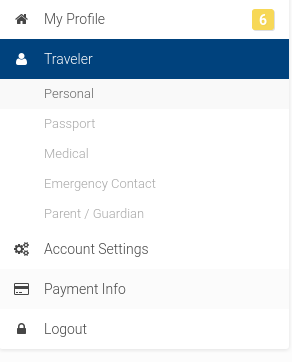 On the left-hand side, click on Traveler to update all of the traveler information. This will include Personal Details, Passport, Medical, Emergency Contact, and Parent/Guardian Information. Personal - Here you will find the traveler's name, date of birth, and email address, as well as the home address and phone number. Passport - Here you will add or update passport information. 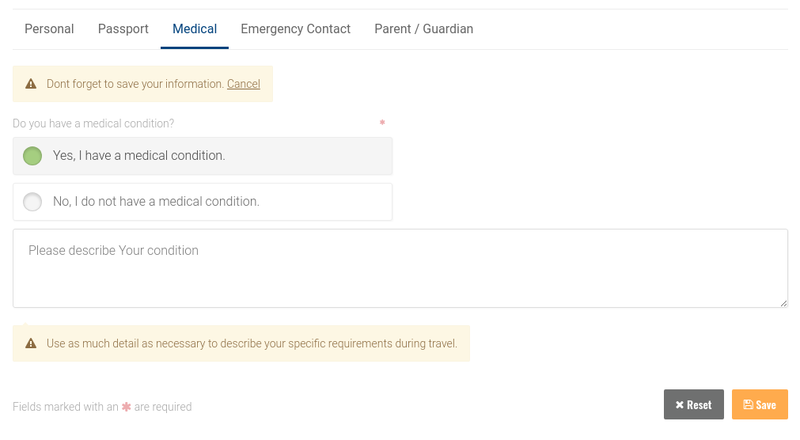 Medical - If you have a medical condition click "Yes, I have a medical condition", describe your condition in the box below, and click save. If you do not have a medical condition, click "No, I do not have a medical condition", and save the information. Emergency Contact - Here you will add or edit the emergency contact information. Parent/Guardian - If you are under the age of 18, you will be required to enter parent/guardian information. All emails corresponding to the trip will be sent to the traveler as well as to the parent/guardian listed. This contact should be different than the emergency contact listed. In the case of an emergency, we will contact the parent/guardian first! In the case that we cannot contact this person, we will reach out to the emergency contact listed. 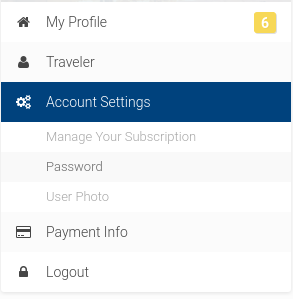 Under Account Settings, you can update your password, manage your subscription, and add/change your user photo. Password - To reset your password, click here, enter the new password, and click "Update Password" to save the information. 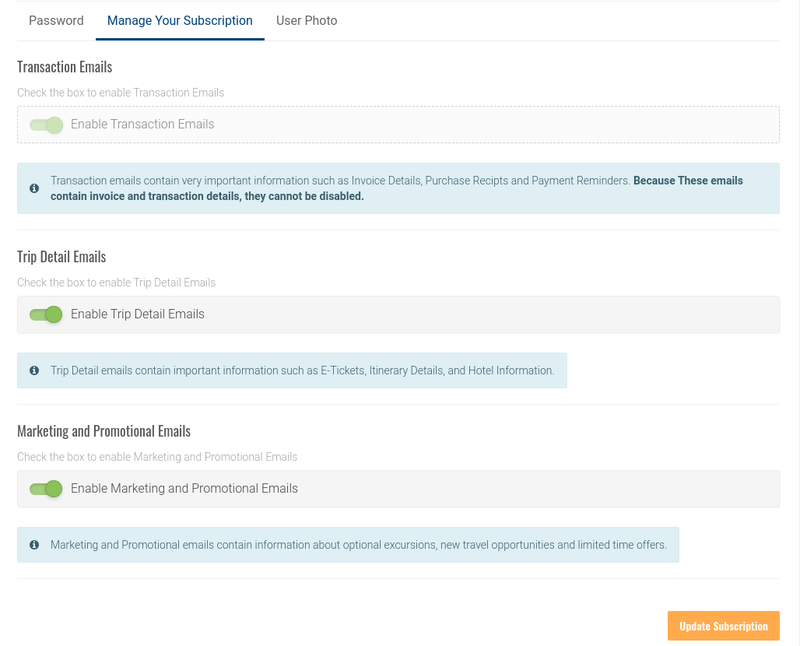 Manage Your Subscription - In this section, you will be able to update your email preferences. You can choose to enable or disable the Trip Detail Emails and Marketing & Promotional Emails. User Photo - Update your profile picture here. 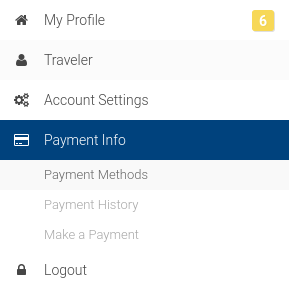 Here you will be able to view and update your payment method, review the payment history, or make a payment towards the trip. Click here to log out of your profile. You'll see My Trips listed on the left-hand side. 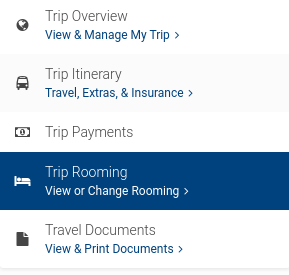 This is where all of your trip information will be listed including the destination, your trip code, and your passenger code. 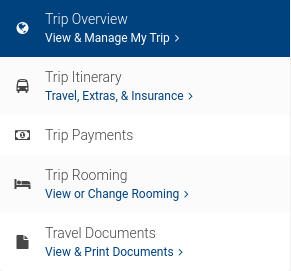 Here you can review the Pricing Details, Payment Status, Trip Planner information, and the Organizer contact information. 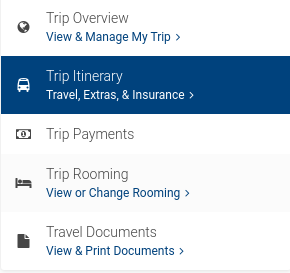 In this section, you can review the Travel Insurance options, your itinerary departure details, your hotel information, the travel exclusives, and the return itinerary. 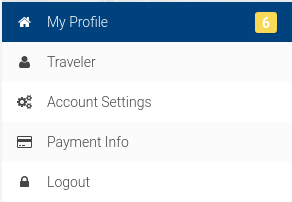 By clicking on each title, you will see a drop down section with more information. Travel Insurance - You can review the insurance options, access the full policies, and purchase comprehensive insurance coverage if you have not already done so. Leave for your #TripOfALifetime - Here you will be able to review your departure itinerary. If the details are still showing as TBA, or your departure time is listed as 12:00am, we haven't released the itinerary for your group yet. Your Hotels - You will see the name and hotel details listed here. Click on the name to review Hotel Contact Details and Amenities. If the hotel is listed as "Breakaway Hotel" this means that your hotel details haven't been released yet. You will receive an email when the details have been added to your profile. Travel Exclusives - Here you will see the excursions and events that are available on your trip. If it is included, there will be an orange banner across the photo that says "Included". If it is not included, the price will be listed and you will have the option to purchase it. Leave for your #TripOfALifetime - This is where your return itinerary will be listed. If the details are still showing as TBA, or your departure time is listed as 12:00am, we haven't released the itinerary for your group yet. 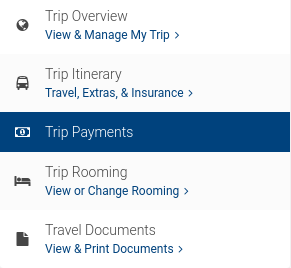 Under the Payments section, you can view your status as well as review your Price Breakdown, your Payment History, and the Payment Dates for your trip. You can also Make A Payment or Email Your Invoice from this page. Under this section, you will find the travel documents you'll need to print for your trip, any important notices, and the Terms & Conditions.